This ketubbah was made in India but contains motives that were brought to India by Baghdadi Jews who had arrived at the end of the seventeenth century. The most striking decorative element are the two large and one smaller fish (as a reference to a hopefully fertile marriage). 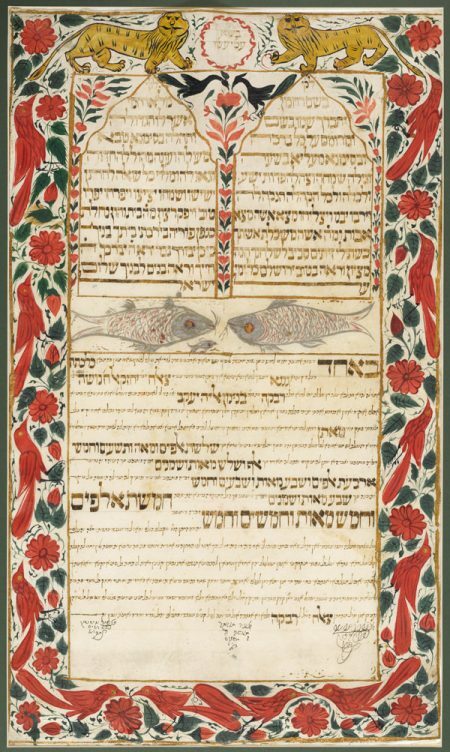 The Rabbis believe that fish bring good luck, since they are mentioned explicitly in the biblical story of creation (Gen. 1:22), “Be fruitful, and multiply, and fill the waters in the seas.” They are also believed to protect against the evil eye, since in the depth of the sea they cannot be hurt. Dowry: 3,195 Rupee in gold and silver jewellery, clothes and bed linen; increment: 1,380 Rupee (before the wedding) and an addition of 780 Rupee.